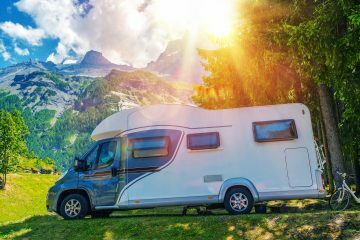 The big question: what do you need before that first trip in the new vacation home (aka recreational vehicle)? If you’re like us and are just starting into a life where you carry your motel room with you, you may find this interesting. 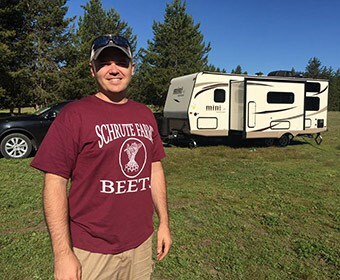 If you’re an old hand, on your fifth trailer, each one larger than the last, and have already visited all 48 contiguous states, read along anyway. We’re always open to corrections or fresh information. For us it’s all new and we’re still learning. 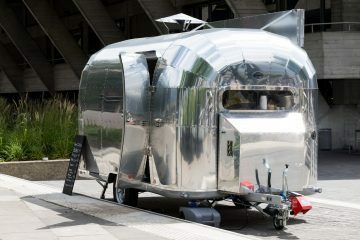 For us, it is not a “camper.” It’s not even a “glamper,” a glamour camper. For us it’s a rolling motel room. Or maybe, as Dave likes to put it, “his retirement home”. 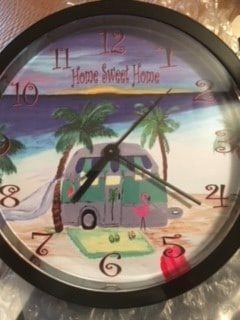 Although Pamela thinks that sounds too much like “nursing home.” The urge came on us while vacationing in Florida. After dropping $1,800 on a studio apartment for a week that featured the world’s (perhaps the universe’s) most uncomfortable couch, it occurred to us that we could carry our own place along. So, we bought a new 26’ travel trailer and next month will pick it up and head out on the maiden voyage (the “shakedown cruise?” The “trip of terror?”). Part of the preparation has been to buy a whole bunch of stuff. Which brings us to the point of this post. What do you really need before embarking on that first adventure. First, remember, you are carrying your home along with you. 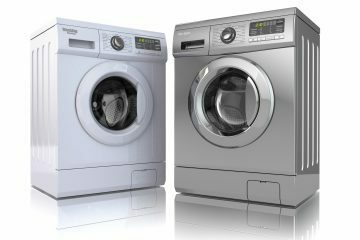 You can get a pretty good idea of what is involved by just looking around your house. You won’t need furniture, but you’ll need pretty much everything else. Hoses—one white and one orange. You really don’t need the “white” hose. There’s nothing special about it except, well, it’s white. That means you won’t get it confused with the orange hose which is kind of important since the orange hose is the one you’ll be using to, among other things, flush out your sewage system. We got the white hose at the Local Wal-Mart and the orange one from Amazon. Leveling blocks. Those jacks on the corners of your trailer are stabilizers, not levelers. 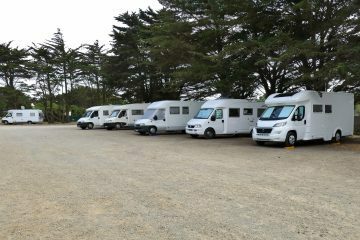 Travel trailers are leveled with the wheels and you pull (or back) onto enough of the blocks stacked up to get things level. Ours came from Wal-Mart and we went with the ones that have a handle through the stack. These also double as bases for the stability jacks when you’re on a nice level concrete pad. Campbell-Hausfeld inflator. Everybody says, “keep the trailer tires inflated to the manufacturer’s specifications.” Since we got air shocks on the Yukon we sprung for the inflator that has a maximum pressure of 150 pounds. If you don’t have air shocks you can get by a little cheaper. Another Amazon purchase. Grill. Blackstone seems to be the favored brand. We opted for the smaller (and cheaper) version. This features a flat top griddle surface and a flip side with ridges to put those grill marks on. Pamela does all of the grilling and most of the cooking. She really wants the 17-inch Blackstone flat top grill but decided to get this one first to see if she really uses it much. Collapsible ladder. The travel trailer is pretty tall and there are things that need to be done on the top. The collapsible ladder is a neat gadget that extends to 12.5 feet but “collapses” flat, taking up about the same space as an old-fashioned aluminum lawn chair. Couldn’t find it locally so another hundred bucks to Amazon. Along with the ladder you need a broom to make sure no pesky tree sticks, or other detritus. 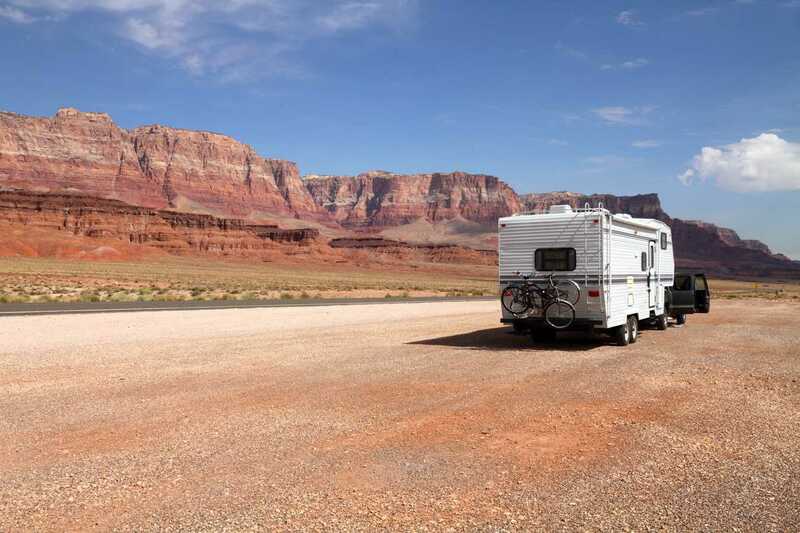 are between you closing the slide out or power awning and leaving to go to another adventure down the highway. So…. we purchase a Collapsible Broom. Why a telescoping broom? There is not a closet in the TT tall enough to accommodate a “regular” broom and dustpan. 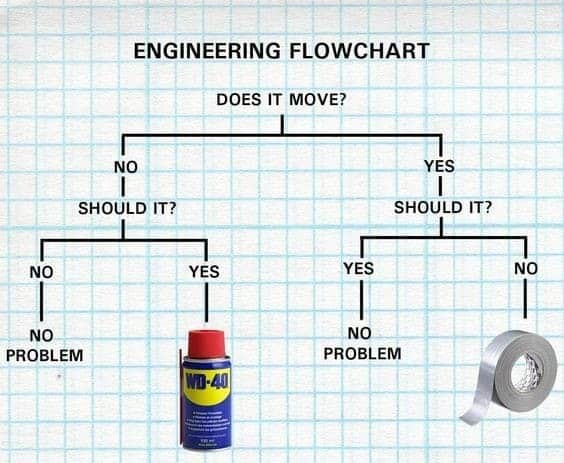 WD-40 and Duct tape. Because, well….. Pamela wanted the duct tape with the cute vintage designs because well, it is stinking cute she says. Cordless drill. Since our 9.6 volt Dewalt had died, well, the batteries had died and replacing them was actually more than a new drill, I got the Porter-Cable 20 volt at Lowe’s. This drill came with two batteries, and once you price spare batteries you’ll understand how much difference that makes. I sprung for the P-C that has two settings, one for low speed and high torque, since my primary purpose for bringing this along is to run those stabilizing jacks down. ¾” nut driver. See 9. Dishes. Get some light dishes. You really don’t want to be lugging heavy glass or ceramic around. Pamela is now in her glory! An actual need for SHOPPING!!!! 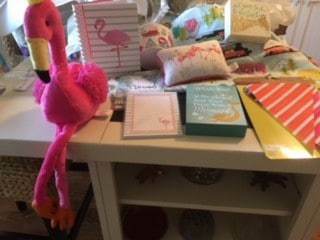 After searching from store to store Pamela found what she had to have – – Pink Flamingo Pattern Dinnerware! It is melamine thus unbreakable. But…. no microwaving Melamine! It emits toxic fumes…… And the shopping did not stop there. Plastic drinking vessels to coordinate with the Flamingo Dishware, stainless steel eating utensils, microwaveable bowls, mixing bowl, collapsible colander and you get it. 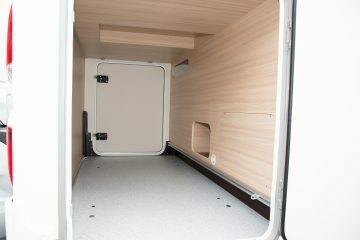 A second complete kitchen that fits in the Glamper. Flamingos everywhere. Why? Because she loves them. Enough said. Portable ice maker. When I saw that there was such a thing I had to have it. It’s not too big and, well, it’s a portable ice machine. Rain-X. We’re going to try to Rain-X the inside of the shower doors. Yes, the same stuff they advertise for windshields, so you don’t have to use your windshield wipers. I suppose any car wax would work but since the Rain-X is specifically formulated for this purpose, we’ll try it first. In case you’re wondering, Rain-X works like wax and fills in those tiny little pores in glass (yep, they are there) leaving nothing for the water to cling to but just in case the bride has purchased a hang-in-the-shower squeegee to remind-me that water left on the glass will eventually fog it up. Basic tools. Remember, the vacation apartment is moving and when it moves there are little twists and turns that can work things loose. It’s always a good idea to have some basic tools around. For us it’s a Leatherman tool (yep, the genuine Leatherman brand since it was a Christmas gift at the office party), pliers, an adjustable wrench (what you call a Crescent wrench), rubber mallet (because there’s always something that needs pounding), and the “luthier bag” (a luthier is a guitar maker and although Dave is NOT a luthier, he does build kit guitars and has accumulated a set of tools that should be relevant to trailer life including a set of screwdrivers, files, a non-marring hammer, feeler gauges, and that sort of stuff). Unrelated tip—I always harden the tips of my screwdriver bits. It only takes a couple of minutes and it seems to help keeping the tips from getting rounded and generally mucked up. Just heat the tip over your propane torch (if you don’t have one it’s under $20 at Lowe’s) until it’s red hot and then quench it in oil (whatever oil you have around, cooking oil will work although I use some pneumatic tool oil that I have around). It’s easy to spot the ones you’ve treated – they’re the ones that are blue. Floor Mats. We’ve accumulated a few floor mats that, we hope, will keep the vacation home from getting too much stuff tracked in by humans and two mini schnauzers. Flamingos. Again she can’t have too many. And they do tend to brighten up the sort of dark and brown interior of the vacation home. Linens. You really do not want to try to keep bringing things from the house. You’ll forget something just as sure as night follows day. We got a set of sheets that packs in its own little bag (when the wife does the folding, not so much when he does it), a quilt set, new of course (with, you guessed it, flamingos). Old linens….. only bath towels and kitchen towels. Coffee maker. One of the necessities of life, right? We opted for a Keurig machine because, well, it’s what we’re used to, and we already buy the coffee pods by the case. Maps. Yeah, yeah, there are Garmin’s and, of course, Google Maps, Google earth, etc., but there really is no substitute for a good atlas to get a feel for the route. Related to maps, the rule of 4-4-2. This was relayed by my brother, the boondocker. No more than 400 miles in a day, arrive by 4:00 in the evening, spend at least 2 days. I suspect we’ll stretch these on longer trips, but if you think about it, 4 hours is about 250 miles at an average of 55 miles an hour (okay, okay, I did well in third grade arithmetic and understand it’s actually 220 miles but close enough). That’s a nice day trip for a mini vacation. We have been advised to take bottled drinking water. Is this because of the quality of “city water” at full hook up sites or due to residue in the new water holding tank and new hoses? We aren’t sure so bottled water we will take for drinking, cooking and of course mini schnauzer water. Semi-related—we sprung for the filter system (Camco branded again from Amazon) because it seems to be a good idea. Not that I don’t trust camp site water but, well….. Clothing. This is not an option. We must bring clothing. As the female counterpart I am thinking, shorts, T-shirts, usual under garments, Capri pants, pair of athletic shoes, flip flops, and maybe some hiking boots. In the winter months, throw in a jacket for cool evenings and a pair of jeans. That is about all I need. Any other suggestions? Him: hmmmmmm. I’m thinkin’ 8 T-shirts and a pair of jeans. Grooming necessities: the usual, soap, shampoo, tooth brushes, floss, tooth paste, combs, brushes, hair dryer. That is about it. Cleaning: Clorox Wipes, Vinegar/dawn cleaning mixture. Multi use surgical towels for cleaning. Him: Remember, the redhead is a nurse and a germaphobe. What does everyone do for a wet mop. I’m thing a Swiffer Wet Jet. But where to store it. Perhaps in the shower stall. I really do not want all of this stuff to clean with in the open and ruining my good time reminding me I might need to clean…. 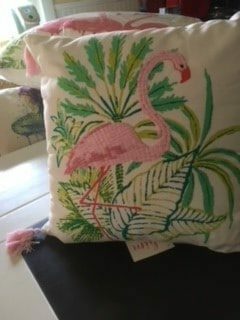 Flamingo, the pink ones…. and Vintage Camper things. She has a trend going here and sea shells, lots of sea shells…..
Last minute thoughts. Four-bar lug wrench because you’ll REALLY want it if you have a flat. Twenty bucks at O’Reilly’s. Flamingo sheets (yes, more flamingos). Flamingo quilt. Insulation for the skylights (everybody says it really helps in hot summers). There it is. For now, anyway. We’re picking up the rolling motel room in about a month and taking the first trip. We expect that we’ll be back after that with a longer list of the things we NOW know we need. Update: Yup, there was more. 21 more final thoughts and items we came across as we prepared for our camper adventure is out! You can find it here.